Mary Houghton married Daniel Albert in Dec 9, 1725 at Lancaster, Worcester Co., MA, USA. Thomas Houghton Sr married Joanna Joslin in Nov 22, 1722 at Concord, Middlesex Co., MA, USA, by Justice Minott; Baily: mp and Dec 22, 1722. Mary Burbeen married Jonas Houghton, son of John Houghton and Beatrix (? ), in Feb 15, 1680/81 at Lancaster, Worcester Co., MA, USA, Torrey: 16 Feb 1681, 1680/1; Woburn, Lancaster; Clemens: Woburn, MA. Josiah Houghton married Mehitable Warner. Marriage Jul 28, 1720 Lancaster, Worcester Co., MA, USA, Benjamin Houghton Senr., by Justice John Houghton; "sd marriage entered at Lancaster & ye list brought & exhibited for Registering Augst. 30th, 1720 by Jno. Houghton, Town Clerk." Burial Chocksett Burial Ground Cemetery, Sterling, Worcester Co., MA, USA, ae 74; Plot S; "When death unto you calls | Your soul Resine you must | to God that judgeth all | Both Wicked and the just | Death is a Debt to Nature Due | Which I have paid & so must you." Benjamin Houghton Sr married Zeruiah Moore in Jul 28, 1720 at Lancaster, Worcester Co., MA, USA, Benjamin Houghton Senr., by Justice John Houghton; "sd marriage entered at Lancaster & ye list brought & exhibited for Registering Augst. 30th, 1720 by Jno. Houghton, Town Clerk." 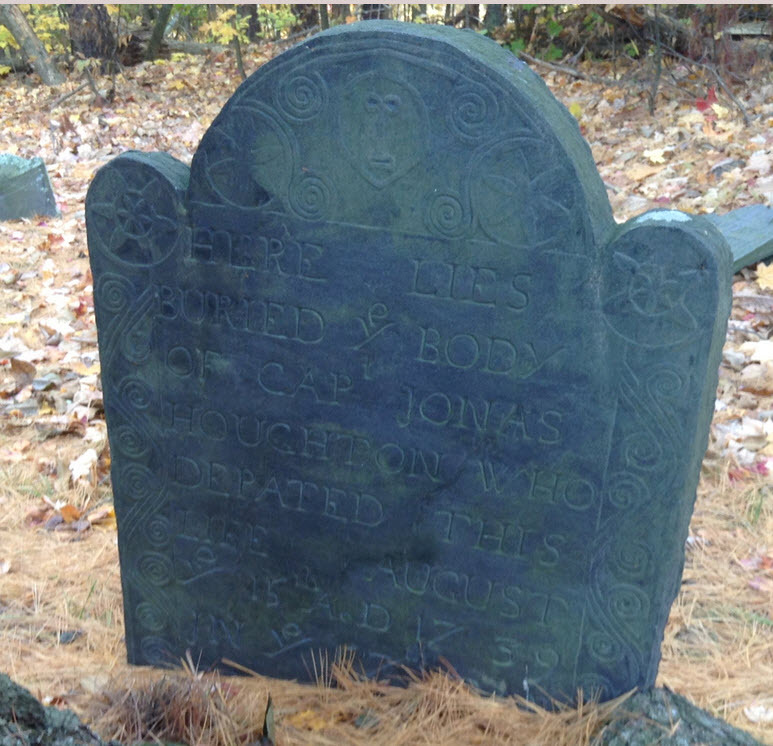 James Houghton Jr married Mary Jones in Oct 8, 1725 at Concord, Middlesex Co., MA, USA, Burr & Gage: 1724, Concord Records; JWH: 10,8,1725; Concord VR & Bailey 8 Oct 1725. John F. Chandler: "Observe that the Lancaster VR have "Josiah" son of "Josiah" and Mary born 1682 "Jul" 2! I'd say that one original record has to be the source of both of these people. This takes the pressure off the seeming double identity of Jonas's son Josiah, whose gravestone extrapolates to a birth date in 1698 Oct."
John Chandler: "> p. 15, " in the 12th and 13th entry, read Jonas & for Josiah &" it applies only to the father's name in those two entries. I still feel that the son's name probably should also be corrected, but the only way to be sure is to go to the original Middlesex County court records and check again. I think it quite possible that Nourse relied on someone else's (erroneous) transcription of those records to extract the ones relevant to Lancaster and was given the correction by a third party. The July/September issue is disturbing and suggests that all the other months on p.15 may be wrong as well." Burial Old Common Burying Ground Cemetery, Lancaster, Worcester Co., MA, USA, "Here lies buried ye body of Capt. Jonas Houghton, who departed this life, August ye 15, A.D. 1739, in ye 57th year of his age"
Capt. 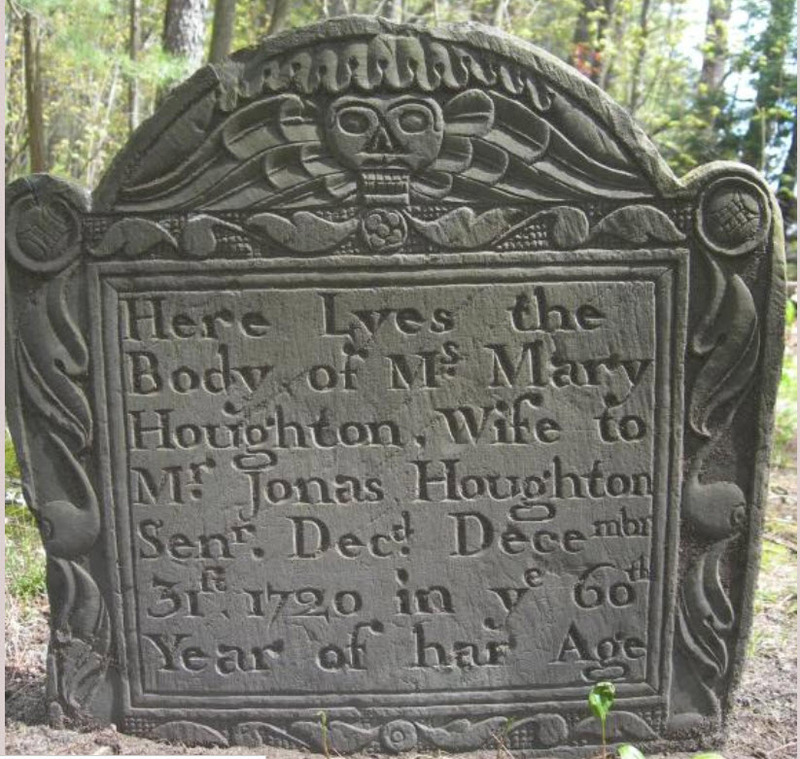 Jonas Houghton Jr married Mary Brigham in Jun 30, 1710 at Marlborough, Middlesex Co., MA, USA. Jemimah Houghton married Samuel Carter Jr., son of Samuel Carter and Dorothy Wilder, in Feb 14, 1724/25 at Lancaster, Worcester Co., MA, USA, by J. Houghton. Daniel Houghton married Lydia Bruce in circa 1713. Death Jun 24, 1748 Lancaster, Worcester Co., MA, USA, Burr & Gage: "aged 52 years, 3 months, 24 days (gravestone at Lancaster)"
Burial Chocksett Burial Ground Cemetery, Sterling, Worcester Co., MA, USA, jBT: "Inscription on stone in Chocksett (now Sterling) Burial Ground, Lancaster, reads: "Here lies buried ye Body of Mrs. Eunice Sawyer ye wife of Lieut. Ephraim Sawyer, who died June 24, A.D. 1748, aged 52 years, 3 m.24ds." Eunice Houghton married Capt. Ephraim Sawyer in Mar 4, 1719/20 at Concord, Middlesex Co., MA, USA, 1st wife; by Justice Minott. Abigail Sawyer b. 23 Apr 1724? Mary Houghton married Gamaliel T. Beaman in circa 1705 at Middlesex Co., MA, USA, Middlesex Probate. Dorcas Houghton married Ebenezer Polley in Jan 11, 1724/25 at Lancaster, Worcester Co., MA, USA, by J. Houghton. Sarah Houghton married Francis Richardson in Jul 7, 1708 at Charlestown, Suffolk Co., MA, USA. 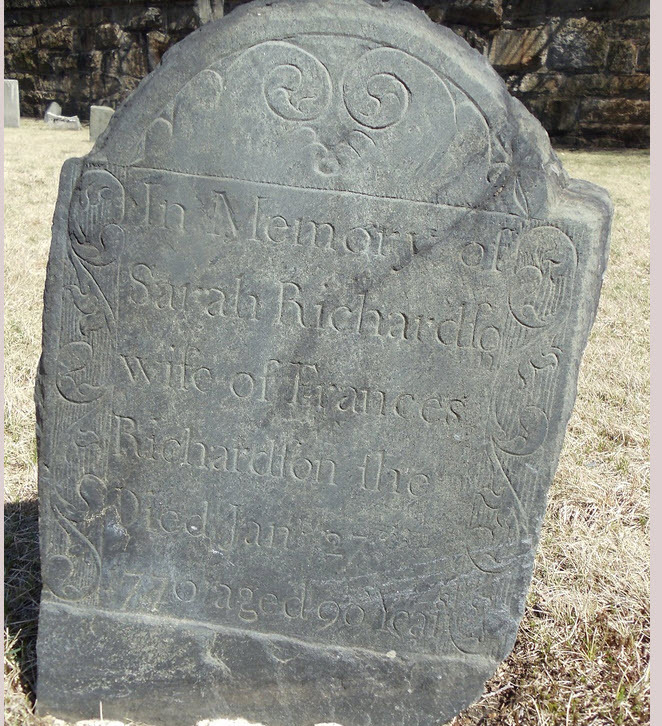 Ruth Houghton married Richard Wilds in Mar 2, 1721/22 at Lancaster, Worcester Co., MA, USA, by J. Houghton. Lt. Silas Houghton and Eunice Sawyer declared their intentions of marriage on Aug 27, 1768 Lancaster, Worcester Co., MA, USA. Lt. Silas Houghton married Eunice Sawyer in Oct 26, 1768 at Lancaster, Worcester Co., MA, USA. Lt. Silas Houghton married Mrs. Sarah Gregory in Dec, 1777 at Princeton, Worcester Co., MA, USA, DAR; Whitecomb: 20 May 1773 Bolton, Sarah Wyman of Harvard. Lt. Silas Houghton married Thankful How in Mar 13, 1783 at Princeton, Worcester Co., MA, USA. Helen M. Houghton married Major Robert Emmet Craig Sr in Aug 4, 1857 at Licking Co., OH, USA. Birth Aug, 1658 Boston, Suffolk Co., MA, USA, Harris: "He was not the John Harris born in Boston 8 Aug. 1658." John Harris Jr. married Mary Houghton, daughter of John Houghton and Beatrix (? ), at Lancaster, Worcester Co., MA, USA, 23 June 1698: JWH date for John Harris and Sarah Houghton; 1/wf; Torrey gives a Mary Houghton as wife of John Harris, but J.W. Houghton gives John Harris as husband of John Houghton the Immigrant's daughter Sarah (with 1698 date), and Mary as wife of Thomas Wilder; Torrey gives 1/wf Mary Houghton (1666-); while this is a different bd than John Houghton the Immigrant's daughter Mary, John Houghton's will of 1684 clearly gives his daughter as Mary Harris (see Burr & Gage, p. 383). John Harris Jr. married Alse (?) in before 1717. Benjamin Harris married Deborah Temple in Nov 18, 1729 at Lancaster, Worcester Co., MA, USA. Mary Harris married Philip Larkin. Philip Larkin married Mary Harris, daughter of John Harris Jr. and Mary Houghton.